I tried to read The Golden Age several years ago and remember that I couldn’t finish it. As I recall, the writing was florid and overblown, and it was a chore to read. While the style here is still florid, it worked for me this time (and I may go back to The Golden Age to see if my opinion of that has changed). The story revolves around Menelaus Illation Montrose, a mathematical genius and member of humanity’s first manned mission to another star – V 886 Centauri. An unmanned probe had been sent there because it's made of anti-matter. If the star can be mined, it promises a future of unlimited energy. Arriving, the probe discovers a moon-sized alien artifact. 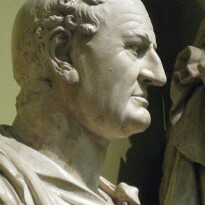 The Monument – as it comes to be called – proves to be a blueprint for communicating with its builders. Unfortunately, as translation slowly progresses, it becomes clear that the star is a trap, and now an armada is on its way from the Hyades Cluster to enslave humanity. Moving at 10% light-speed, it won’t arrive for 8,000 years but for a star-faring race that’s an insignificant amount of time. Part of the starship’s crew mutinies; seizes control of the anti-matter after massacring their enemies; and returns to Earth, where they establish a benevolent dictatorship based on their control of energy. Menelaus’ role up to this point has been peripheral. In an effort to become smart enough to translate the Monument, he had injected himself with a witch’s brew of biochemicals. He becomes smarter but he also goes insane. For the next few centuries, the mutineers occasionally awaken him from suspended animation to interpret parts of the artifact. Meanwhile, two factions have emerged. One faction, led by Menelaus’ former friend, wants to prepare a future humanity that will be of maximum use to the invaders. The other side, led by a posthuman chimera created by the mutineers, wants to raise humans up to a level where they can negotiate with the aliens on a more equal footing and retain as much autonomy as possible. It becomes apparent, as more of the Monument’s secrets emerge, that the Hyades is only the first layer in a hierarchy of galactic civilizations. They are the servants of an even greater polity in the Praesepe Cluster that, in turn, is subordinate to the Milky Way’s masters, who reside in the M3 cluster, nearly 34,000 light-years from Sol. A civilization as far above humanity as humanity is above the amoeba. It’s that controlling civilization that the posthuman faction aims to contact. The novel ends on a cliff with the reader hanging but I’m interested enough to want to know more so when I return this volume to the library, I’m going to pick up the sequel. I complained in my review of David Brin’s Existence that I couldn’t find any hard SF that had both interesting ideas and interesting characters. In Count to a Trillion, I’ve found an answer to my plaint. Wright doesn’t develop any character beyond Menelaus – and that character can be painted in broad, cartoonish strokes – but I like him and I’ll take what I can get. 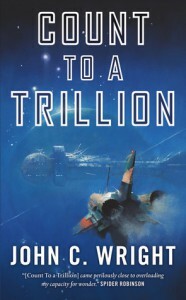 Count to a Trillion is recommended for the hard SF fan primarily; but if you’re an SF fan in general, you may want to check this book out. PS - The copy editor in me raged because I found more typos in this published edition than in the unproofed galley of Stephen Donaldson's The Last Dark that I got to read earlier this month.